The left's bias against Israel and sympathy for the Palestinian cause is a historic mistake. It is a betrayal of liberal principles. It is the same mistake the left made in the 20th century when it supported communists around the world. Much of the western media promotes this left-wing narrative against Israel, including media like the BBC and RTE that pretend to be "neutral". Taxpayers in the UK and Ireland are forced by law to pay for anti-Israel state media. "The Huffington Post: Bias In Pictures." 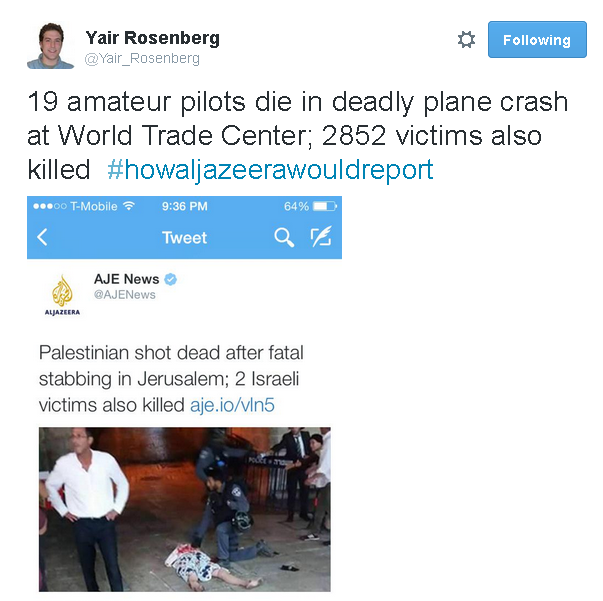 graphically shows the kind of bias in reporting on Israel that is found throughout the western media. Some excellent sites cover the endless media bias against Israel in both news reporting and opinion. I particularly recommend CAMERA and Honest Reporting. LGF (before it went insane) produced the following classic example of media bias from Reuters, 1 Sept 2007. But instead, Reuters title their story: "Palestinian youth killed in protest at Gaza border". Why? We all know why. Reuters say the dead protester "was accidentally hit by a bullet fired by Hamas Executive Force officers trying to keep the crowd under control." Accidentally? As the once-great Charles Johnson said: "When was the last time you saw Reuters give Israel the presumption of innocence like this?" Typical anti-Israel spin in The Guardian. 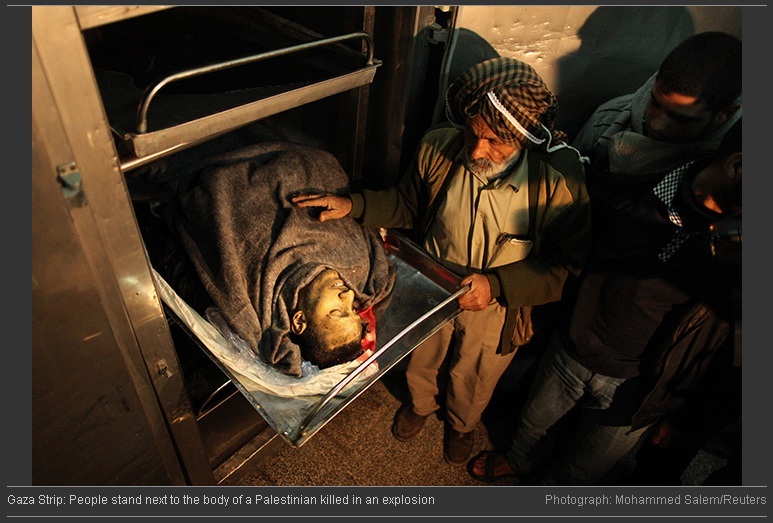 This picture of an unnamed dead Palestinian appears in "24 hours in pictures", The Guardian, 28 December 2011. As CiF Watch asks, why did the Guardian omit the information that this guy was an Al Qaeda-linked terrorist who was killed by the brave IDF. If you want the full story, you won't get it in The Guardian. 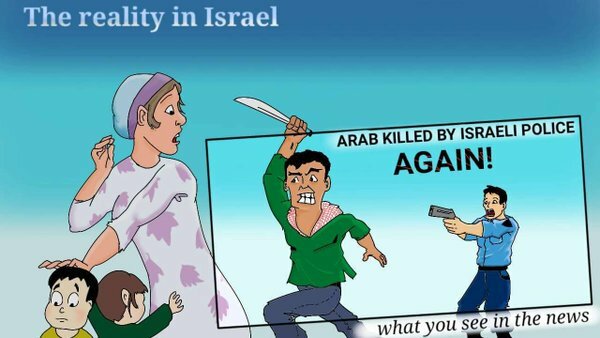 Cartoon attacking the distorted media coverage of the "stabbing intifada" in 2015-16. "Muslims fearful after Muslim attack on non-Muslims". Al Jazeera English spins a Muslim terror attack on Jews into a narrative where Muslims are the victims. Palestinian Muslim jihadis carry out the most depraved killing of Jewish children at Itamar in Mar 2011. Any objective media outlet would focus on the racist beliefs held by the Palestinians that would allow them to stab a little 4 year old boy and a baby to death (and then celebrate the killings). The clip could look for example at the constant Jew hatred on Palestinian TV, in mosques and in schools. But no, after yet another Muslim slaughter of the most innocent and defenceless non-Muslims, the closing message is: "Muslims fearful of retaliation after Muslim attack." Of course. Israeli comedy from Latma TV takes aim at the way leftist media uses language. The politically correct reporter tries to say "youths", not "Arabs". Fake news at the New York Times, 21 Apr 2018. In an article about fake news, Nellie Bowles in the New York Times inserts her own fake news. Her example of a "far-right conspiracy" is that "Palestinians Pay $400 million Pensions For Terrorist Families", which is entirely true. You would think that if you were writing an article about fake news, you would be extra careful to Google your facts, but no. In the article, she spreads fake news, because it is Israel. After controversy, the New York Times corrected it. The above shows the original, copied at CNBC. "Pallywood". Acted and staged scenes for gullible western media by Palestinian activists and mobs. The Tamimi family - tireless Pallywood stars. The child star "Shirley Temper" (Ahed Tamimi). The Battle of Jenin in April 2002 was a particular low point for the media. The media promoted claims of a massacre that turned out to be fiction. The Myth Of Jeningrad by Tom Gross, May 13, 2002. The Battle of Jenin has one, strong, lasting lesson - that one should not trust the European media on Israel. Acted and staged scenes for gullible western media by Palestinian activists and mobs. Pallywood: "a settler ran over children as they were coming out of a mosque after prayer". This is The Silwan incident, Oct 2010. 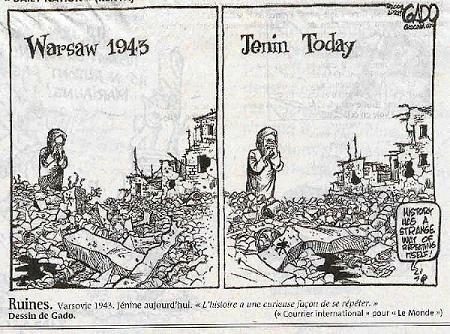 Revolting cartoon in Le Monde, 2002, lies about The Battle of Jenin. Why do people support the Palestinians? The strange press coverage is a lot to do with it. For logical reasons: The most criticised countries in the world will be the least criminal countries like Israel, the US and the UK. For obvious reasons: Journalists prefer assignments in civilized countries like Israel with good food, good broadband, comfort and safety, rather than impoverished hellholes where they may get kidnapped. Hence, lots of western journalists in Israel. Very few in Sudan, Somalia or the Caliphate. Hence, lots of journalists filling copy attacking Israel. Very few journalists criticising or writing about African or Islamic hellholes. For obvious reasons: Western journalists in Gaza have to be anti-Israel. Western journalists in dictatorships tend themselves to be anti-Western. Because only such people are safe. Western journalists in Gaza tend themselves to be anti-Israel. Because only such people are safe. So we only get one view on the western news. Why Your Streets Are Full of Foreigners, by anti-Israel British leftie Kieron Monks, contains a rare honest quote from a western aid worker in Palestine, explaining why it is easy for western lefties to go to Palestine rather than, say, Sudan: "Palestine is the best-kept secret in the aid industry. People need field experience and Palestine sounds cool and dangerous because it can be described as a war zone, but in reality it's quite safe and has all the comforts that internationals want. Quality of life here is so much higher than somewhere like Afghanistan, but we don't tell anyone so that we are not replaced or reassigned." There is freedom of the press in Israel, and journalists can cover it as they wish. Reporters enjoy the good life in Israel. "It's much easier to report from Israel than a place of real danger." Israel simply won't fabricate information and lie as the Palestinian Arabs consistently do. All of these, ironically, are why Israel gets a bad press, not good. Former AP correspondent Matti Friedman does a very good job of explaining how and why western reporters get Israel so wrong. An Insider's Guide to the Most Important Story on Earth, Matti Friedman, August 26, 2014. Journalists love covering Israel, and hate covering nasty places: "When I was a correspondent at the AP, the agency had more than 40 staffers covering Israel and the Palestinian territories. That was significantly more news staff than the AP had in China, Russia, or India, or in all of the 50 countries of sub-Saharan Africa combined. It was higher than the total number of news-gathering employees in all the countries where the uprisings of the "Arab Spring" eventually erupted. To offer a sense of scale: Before the outbreak of the civil war in Syria, the permanent AP presence in that country consisted of a single regime-approved stringer. The AP's editors believed, that is, that Syria's importance was less than one-40th that of Israel. I don't mean to pick on the AP-the agency is wholly average, which makes it useful as an example." As the reference to the Syrian stringer shows, media coverage from nasty places is often government-approved, because no outside journalist wants to go there. And hence the distorted stats: "In all of 2013 .. the Israeli-Palestinian conflict claimed 42 lives - that is, roughly the monthly homicide rate in the city of Chicago. ... In contrast, in three years the Syrian conflict has claimed an estimated 190,000 lives, or about 70,000 more than the number of people who have ever died in the Arab-Israeli conflict since it began a century ago." Anti-Israel reporters are safe in Gaza. Pro-Israel reporters (or even neutrals) are not. "There has been much discussion recently of Hamas attempts to intimidate reporters. Any veteran of the press corps here knows the intimidation is real, and I saw it in action myself as an editor on the AP news desk. During the 2008-2009 Gaza fighting I personally erased a key detail - that Hamas fighters were dressed as civilians and being counted as civilians in the death toll - because of a threat to our reporter in Gaza. ... In addition, reporters are under deadline and often at risk, and many don't speak the language and have only the most tenuous grip on what is going on. They are dependent on Palestinian colleagues and fixers who either fear Hamas, support Hamas, or both." What the Media Gets Wrong About Israel, Matti Friedman, 30 Nov 2014. "Many freshly arrived reporters in Israel, .. adrift in a new country, undergo a rapid socialization in the [social] circles I mentioned. This provides them not only with sources and friendships but with a ready-made framework for their reporting - the tools to distill and warp complex events into a simple narrative in which there is a bad guy who doesn't want peace and a good guy who does. This is the "Israel story," and it has the advantage of being an easy story to report. ... You can put your kids in good schools and dine at good restaurants. It's fine if you're gay. Your chances of being beheaded on YouTube are slim. Nearly all of the information you need - that is, in most cases, information critical of Israel - is not only easily accessible but has already been reported for you by Israeli journalists or compiled by NGOs. You can claim to be speaking truth to power, having selected the only "power" in the area that poses no threat to your safety." The ideological roots of media bias against Israel, Matti Friedman, Winter 2015. "How have the doings in a country that constitutes 0.01 per cent of the world�s surface become the focus of angst, loathing, and condemnation more than any other? We must ask how Israelis and Palestinians have become the stylised symbol of conflict, of strong and weak ... not Turks and Kurds, not Han Chinese and Tibetans, not British soldiers and Iraqi Muslims, not Iraqi Muslims and Iraqi Christians, not Saudi sheikhs and Saudi women, not Indians and Kashmiris, not drug cartel thugs and Mexican villagers." The media promotes certain stories, hides others: "Vandalism of Palestinian property is a story. Neo-Nazi rallies at Palestinian universities or in Palestinian cities are not ... Jewish hatred of Arabs is a story. Arab hatred of Jews is not. ... 100 houses in a West Bank settlement are a story. 100 rockets smuggled into Gaza are not. The Hamas military build-up amid and under the civilian population of Gaza is not a story. But Israeli military action responding to that threat - that is a story ... Israel�s responsibility for the deaths of civilians as a result - that�s a story. Hamas�s responsibility for those deaths is not." Journalists see themselves as agents of change: "The international press in Israel had become less an observer of the conflict than a player in it. It had moved away from careful explanation and toward a kind of political character assassination on behalf of the side it identified as being right." The Over-reporting of Israel, Honest Reporting, 26 April 2004. "Israel - a tiny nation the size of the state of New Jersey - receives approximately 75 times more coverage than other areas of equal population. In comparison to other nations involved in armed conflict (where world media attention increases), Israel receives over 10 times more coverage by population." No time for Africa by Evelyn Gordon, 19 July 2004. "Over the past 4 years the Israeli-Palestinian conflict has caused some 4,000 deaths and .. displaced some 15,000 people. The Darfur conflict, in less than a third of that time, has caused an estimated 30,000 deaths and displaced some 1.2 million people." "Yet archive searches of major newspapers in the US and Europe reveal that over the last year, these papers have published from 7 to 14 times as many articles on Israel as on Sudan. The New York Times, for instance, lists 260 articles on Sudan and 2,837 on Israel; the London Times figures are 148 and 1,118; Die Welt's are 568 and 8,205; El Pais lists 166 and 1,776." Guess who forgot Sudan by Amotz Asa-El, 29 July 2004. Why so much coverage of Israel and so little of Sudan? "Israel is host to more than twice as many Western correspondents than the entire Arab world". Why? The answer does not reflect well on the profession of journalism. "First of all, it is much more pleasant for a foreign correspondent to be stationed in Jerusalem or Tel Aviv than in Khartoum, even before the imposition there of Shari'a law, not to mention hell holes such as Darfur, where most Western journalists are not built to spend more than a short period of time without beginning to wonder why they chose their profession." The distorted use of language, especially in headlines, is a key feature of Western reporting of Israel. Once you realise how things could be phrased differently, you start seeing it everywhere. How CNN covered the synagogue massacre, Nov 2014, in which two Jew-killers were shot by police. 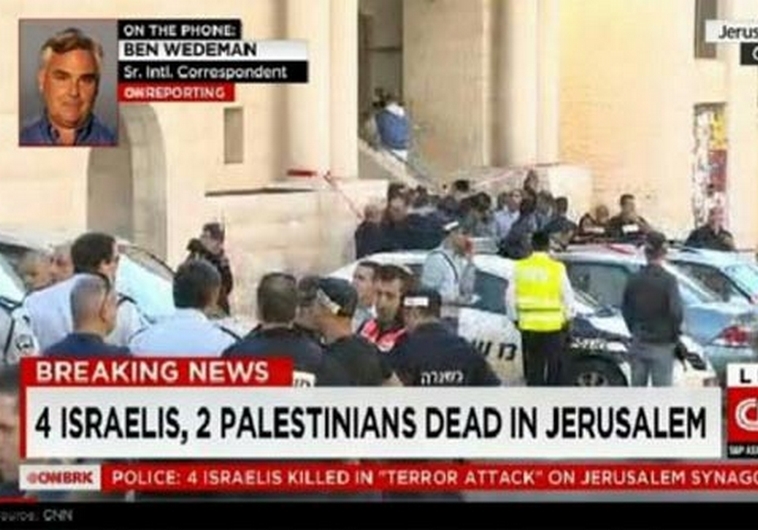 "4 Israelis, 2 Palestinians dead in Jerusalem". See other hopeless media headlines of the attack. 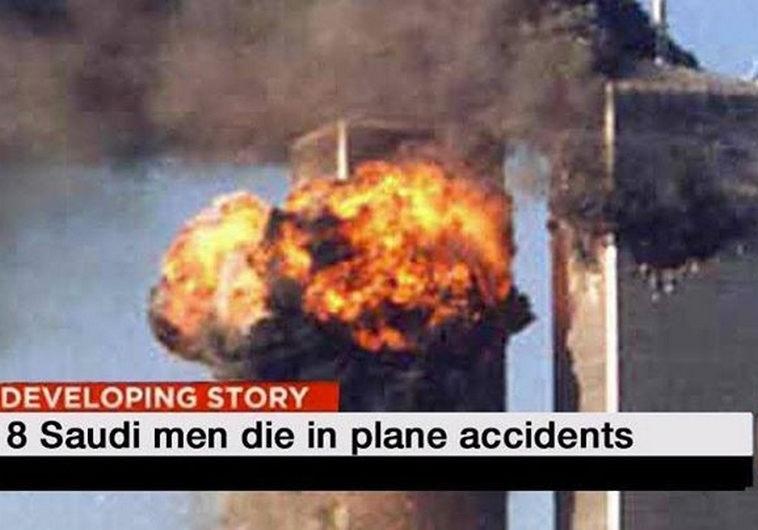 The above spawned parodies showing how CNN would cover other events. Al Jazeera is mocked for this outrageous headline. "School for Journalists". From Dry Bones Blog. 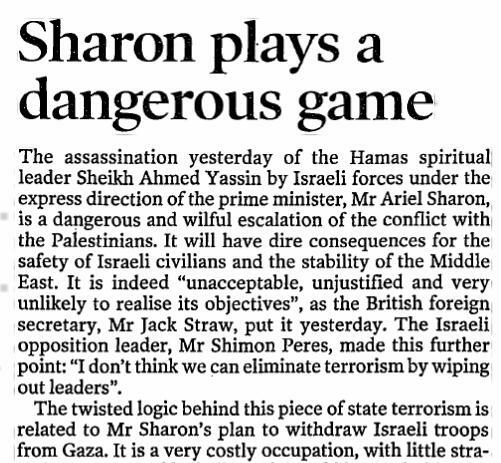 The Daily Telegraph, 8 June 2016, reports on the Islamic terrorist shooting of Jews in a cafe in Tel Aviv in June 2016. Apparently the headline should mention that the cafe may be a civilian target, but, being in a city, is "near" to some possible military target. The headline doesn't even mention the Islamic terrorists. UN UN Secretary-General Kofi Annan: "I condemn the targeted assassination of Ahmed Yassin. Such actions are not only contrary to international law but they do not help the search for a peaceful solution." UN Secretary-General Ban Ki-moon hailed Osama bin Laden's death as a key turning point in the struggle against terrorism. EU EU foreign policy chief Javier Solana, described the assassination as "very, very bad news". EU foreign policy chief Catherine Ashton said: "I would like to congratulate the U.S., pay tribute to its determination and efficiency in reducing the threat posed by terrorists and underline the close cooperation between the EU and U.S. in the fight against terrorism." UK British Foreign Secretary Jack Straw said: "Israel is not entitled to go in for this kind of unlawful killing and we condemn it. It is unacceptable, it is unjustified and it is very unlikely to achieve its objectives." Prime Minister David Cameron said that bin Laden's death would "bring great relief" around the world. France French President Jacques Chirac "unreservedly condemned" Israel's assassination of Hamas terror leader Yassin. French Foreign Ministry spokesman Herve Ladsous also said: "France condemns the action taken against Sheikh Yassin, just as it has always condemned the principle of any extra-judicial execution as contrary to international law." 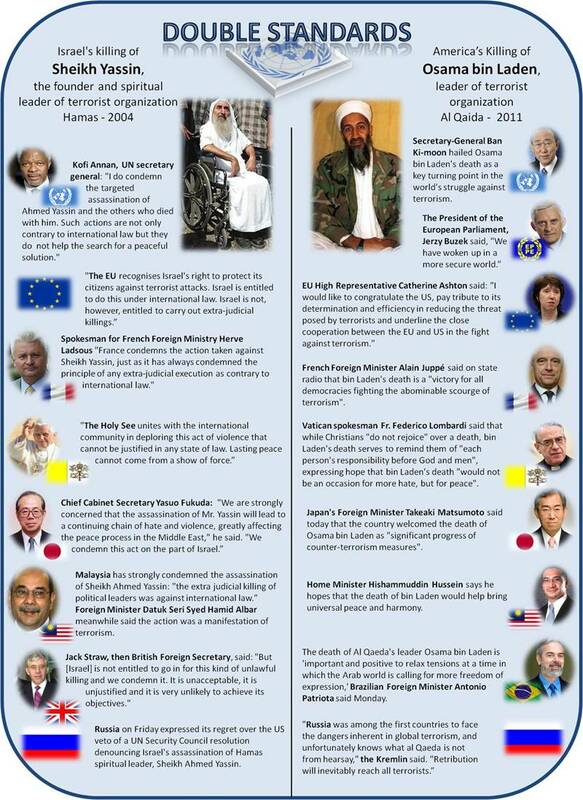 French Foreign Minister Alain Jupp� said on that bin Laden's death is a "victory for all democracies fighting the abominable scourge of terrorism. France, the United States and European states work closely together to fight terrorism, so I'm overjoyed at the news." Norway Norwegian Foreign Minister Jan Petersen: "This act will contribute to increased tensions in the area and will make it more difficult to implement an Israeli withdrawal from Gaza." Norwegian Foreign Minister Jonas Gahr St�re called the death of bin Laden "a break-through in the fight against terror". Vatican "The Holy See unites with the international community in deploring this act of violence that cannot be justified in any state of law. Lasting peace cannot come from a show of force." Vatican spokesman Fr. Federico Lombardi said that while Christians "do not rejoice" over a death, bin Laden's death serves to remind them of "each person's responsibility before God and men" and "bin Laden must answer to God for having killed an innumerable number of people and exploiting religion". Tears for Yassin in the Irish Times in 2004. Their editorial of 23 Mar 2004 describes his killing as "state terrorism". 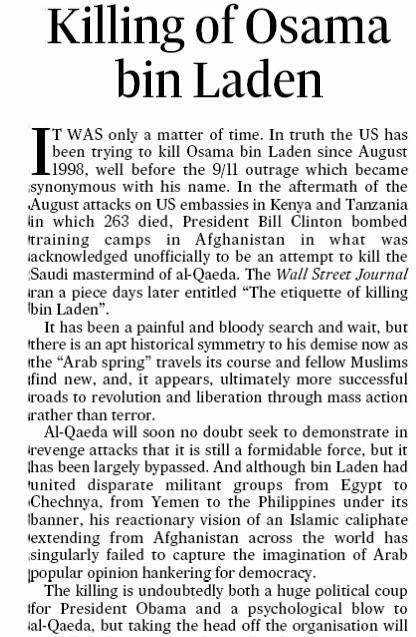 But no tears for Bin Laden in the Irish Times when their hero Obama kills him in 2011. Their editorial of 3 May 2011 notably does not describe his killing as "state terrorism". A graphic summary of the double standard. Survey of letters about Israel in the Irish Times after the Gaza flotilla clash of 31 May 2010. 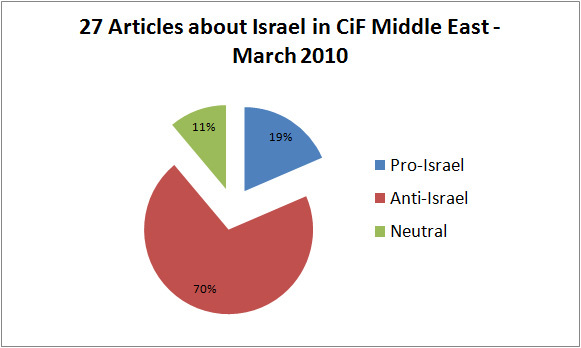 Survey of articles about Israel on The Guardian's "Comment is Free: Middle East" section in March 2010.